Patanjali Atta Noodles: Patanajali Ayurved, the FMCG venture promoted by yoga guru Baba Ramdev. 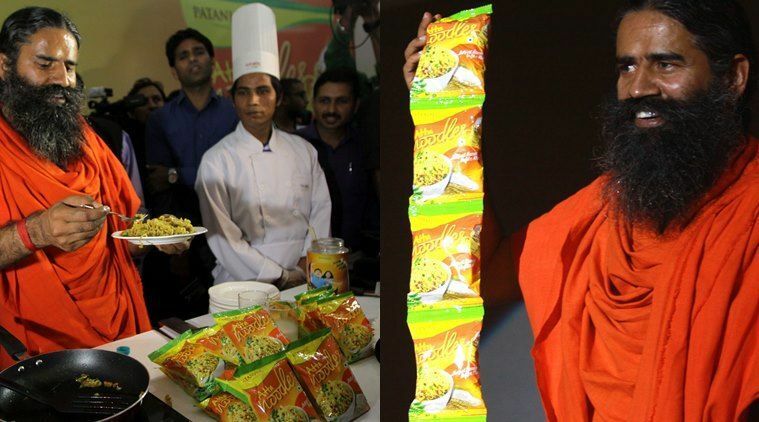 He launched the much awaited Patanjali Atta Noodles on Monday. Patanjali Atta Noodles aiming to take on Nestle’s Maggi which has returned to the market after a 5-month ban. Patanjali claims that its noodles does not have lead or taste enhancer monosodium glutamate (MSG). They are planning to sold these patanjali atta noodles across 3 lakh outlets in India. “Jhat pat pakao, aur befikr khao” is the catchline of the Patanjali noodles. Baba Ramdev also hinted at a range of baby products he plans to launch next. Patanjali noodles will use rice-bran oil and not cheap and inferior palm oil as used by others, the company says. You can check out the Patanjali Atta Noodles Price and other Patanjali product details from below article. Patanajali has priced its noodles of 70 gram pack at Rs. 15, claiming it to be cheaper from competitors. “It is Rs. 10 cheaper from our rivals noodles, which are selling atta noodles at Rs. 25,” he said. Baba Ramdeve has said that the noodles “will be made from whole wheat flour (atta), not like noodles of other companies which are made up of maida and has only 10 percent atta”. “We will launch baby care under ‘Shishu Care’ brand, beauty care products under ‘Saundrya’ brand, health supplement powder under ‘Power Vita’ brand by the end of December. We will also enter into textiles category under ‘Vastram’ brand,” he said. Also See: Hair Fall – Natural Home Made Remedies for Hair Fall & Dandruff. Patanjali will set up five manufacturing plants in Delhi NCR, Madhya Pradesh, Maharashtra, Karnataka and Uttar Pradesh within a year. These plants will also make other Patanjali products. That’s it Bro’s, This is the whole and sole article about Patanjali Atta Noodles and Patanjali Products. If you like this news please share it to your friends.